What size urn do I need to purchase? -Typically, 1 pound of body weight will yield slightly less than 1 cubic inch of ash. It is best to purchase an urn in which the capacity is equal to or greater than the deceased person’s body weight. This applies to pet urns as well. Can ashes be placed directly in the urn? -No, they cannot. Due to my urns being hand riveted, many of the seams are not airtight. Ashes must be contained inside of a plastic bag. I provide a heavy plastic bag that serves as a liner and place it in the urn for you. This can then be sealed, securing the ashes in the urn. How are your urns sealed? -A small packet of fast setting epoxy with instructions is included with all of my urns that have a removable lid. Some of my urns have a false bottom that is held in place with brass screws. How long does it take to receive an urn? -The majority of my customers desire some form of customization to their urn. Because of this I do not keep urns in stock for immediate shipment. However, I do everything possible to accommodate my customer's needs and deliver my products within the necessary time frame. I can give you an idea of how long this will take based on my workload when you place your order. In what ways can you customize an urn? -I can add color using patinas, etch names, dates and designs on any of my basic urns, or make a completely custom urn design for you. Please look through my custom urn gallery to get an idea of what I am capable of or contact me for a more detailed description of your options. What is a maker’s mark? - Maker’s marks were first used in fourteenth century London by silversmiths in an attempt to prevent the use of low quality silver. Each craftsman had a special mark that they stamped into their work before it left their shop. This mark allowed the piece to be traced back to the party responsible for its production if it was found to be an inferior product. 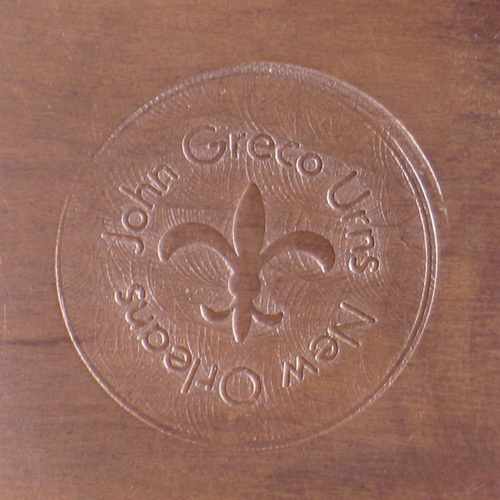 All of my urns are stamped on the bottom with my maker’s mark, assuring that you are receiving a genuine, handcrafted John Greco urn. Can urns be shipped directly to a funeral home? -Yes. Simply provide me with the name and address of the location you wish your urn to be shipped to. -All of my urns are shipped using standard ground shipping free of charge in the continental United States. Express shipping options are available at an additional cost. These services are quoted at the time of purchase. An email with a tracking number will be sent to you when your order ships so you know exactly when your urn will arrive.